As a forward -looking, dynamic and cosmopolitan city, it’s not surprising that Barcelona’s economy is thriving compared to other areas of Spain. In buzzing Barcelona, shops, hotels, businesses, bars and restaurants continue to grow and adapt to changing fashions and trends, while still maintaining the essence of a functional city built on trade, textiles and master craftsmen. Unlike other world class centres that can lose their character in the rush to embrace globalisation, Barcelona has got the balance right, promoting small business growth, as well as welcoming multinational brands. In a climate that is challenging to say the least, Catalonia is a champion in economic terms, ranking third in mainland Europe for attracting foreign investment and first in job creation. KPMG Investment Monitor placed Barcelona within the world’s top 10 investment hotspots for foreign investment projects between 2008 and 2012—an incredible achievement in recession-hit Europe, with Germany, France and the Netherlands bringing in the most companies. When you look beyond the city’s aesthetic beauty, it’s not hard to see what the attraction is. Barcelona is extremely well organised in business terms, with an engaged and innovative commercial community. According to Miquel Valls, President of the Barcelona Chamber of Commerce, the Catalan economy is slated to grow by 2.1% in 2015—0.7% more than the Eurozone average—and economic recovery is solid. In 2013, the autonomous region boasted a year-on year-recovery rate of 1.9%; its most positive figure since 2008. With only 1.6 million metropolitan inhabitants and a wider community of five million, Barcelona contributes a staggering 19.8% of Spain’s GDP, and a third of Catalonia’s total GDP at around €61.9 billion. Accessible by sea, land, and air and well-connected to Europe and the rest of the world, the city boasts a strategic location for many different markets. A magnet for talent, more than half of Barcelona’s employees work in high-knowledge sectors, and diversity is truly celebrated here, with more than 17.4% of the city’s residents from abroad. Around 438,385 companies have their headquarters in the Catalan capital— 14% of the whole of Spain—and in recent months, Barcelona has proved its mettle in global business performance. Travel company eDreams ODIGEO was valued at €1.2 billion after going public in April, while software portal Softonic announced 125 million monthly users. By nurturing an open approach to business, Barcelona has become adept at attracting leading multinationals, encompassing everything the investor needs: tempting business incentives, positive lifestyle indicators, competitive labour costs and a skilled workforce. 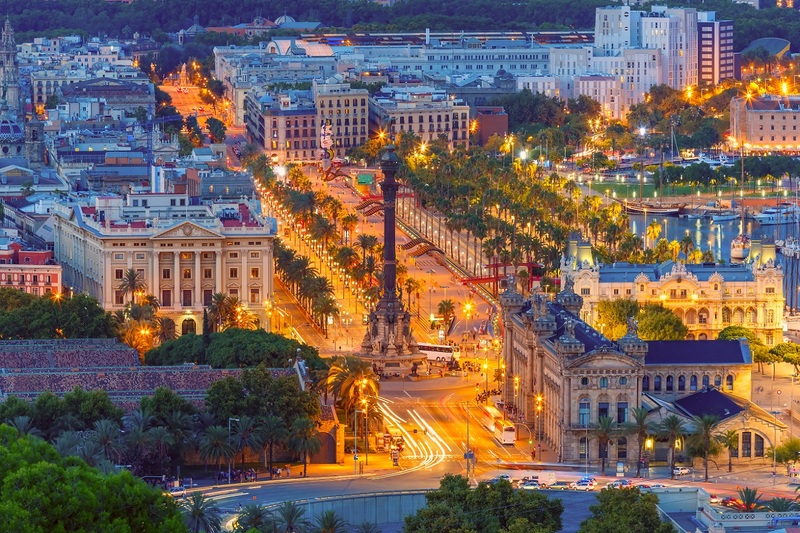 Barcelona also enjoys a reputation for growing, and attracting, visionaries. The creative ones—Gaudí, Cerdá, Miro, Tapias, the creators of Mango, Tous and Camper—are well known, but there is also a quieter group of business names such as Puig, Desigual and Custo, that have built up global empires. Barcelona prides itself on nurturing start-ups, once again punching higher than the European average with entrepreneurial activity in the resident population three points ahead at 7.9%. The predominance of small and medium enterprises and micro-companies are characterised by their ability to adapt to changing environments and trends. Old barrios (neighbourhoods), once run down and neglected, are now hotspots for new SMEs, whether they be office buildings, boutique shops, and sophisticated hotels, restaurants and bars. With their eyes fully focused on sustained economic growth, business experts at Barcelona city council have set up a dedicated Growth Centre, that is committed to facilitating dialogue between the public and private sectors. An action plan has also been drawn up to galvanise new enterprise and keep Barcelona moving in the fast lane. A strong believer in private-sector-led growth, the city council has a sound fiscal policy and budget and one of the lowest municipal debts in Spain. Barcelona City Council sets an example to business and appreciates its suppliers — so much so that it pays within 30 days from the date of invoicing as standard. The council provides a one-stop shop for businesses and walks investors through any red tape while offering free coaching on online company incorporation, accessing funding, staff recruitment and tax registration. Barcelona City Council earned itself an indicative credit level rating of AA from Standard and Poor’s in 2013. Education is also an important economic priority for the city. There are 12 universities in Catalonia, with a total of 242,000 students, and eight of these are in the metropolitan area which accounts for 90% of enrolment in both public and private universities. Two of Barcelona business schools — IESE and ESADE — are among the 25 best in Europe and the top 120 in the world. In terms of exports, the Barcelona province recorded a record volume in 2012, valued at €45.44 billion. This accounted for a fifth of Spain’s total foreign trade figures. The city has close to 41,000 exporting companies, a third of Spain’s total. For those with an eye on the future, Barcelona really is the place to be.